The fiercest surprise often come from the most familiar foes! Just as no single class description can define every fighter, rogue, or wizard, no single creature entry can truly cover every vicious champion, unholy priest, or savage sorcerer is a band of organized and intelligent monsters. With Pathfinder RPG Monster Codes, fleshed-out hordes are at your fingertips! This volume presents a trove of entries for 20 classic monster races, giving you new ways to use your favourite monsters in a variety of encounters and challenge levels. 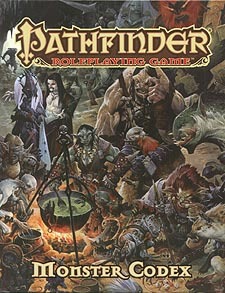 Pathfinder RPG Monster Codex is an indispensable companion to the Pathfinder RPG Core Rulebook and Pathfinder RPG Bestiary. This imaginative tabletop game builds upon more than 15 years of system development and an Open Playtest featuring more than 50,000 gamers to create as cutting-edge RPG experience that brings the all-time best-selling set of fantasy rules into a new era. New feats, equipment, spells, and archetypes to help you customize all 20 monstrous races - and the adventurers who fight or trade with them. A horrific new monster associated with each race - allies, thralls, and variants.